The registration fee is $15 per person. In anticipation of high demand, pre-registration is encouraged. Interested participants can submit their information at http://bit.ly/WesternShoreLC . Registration may also be competed by contacting the American Farmland Trust at (301) 330-3460 or by email at womenforthelandmd@farmland.org. “We anticipate that this will be a successful event and hope to see it expand to neighboring regions. And if the demand is high enough, we may look to host a similar event in the future,” Czajkowski said. 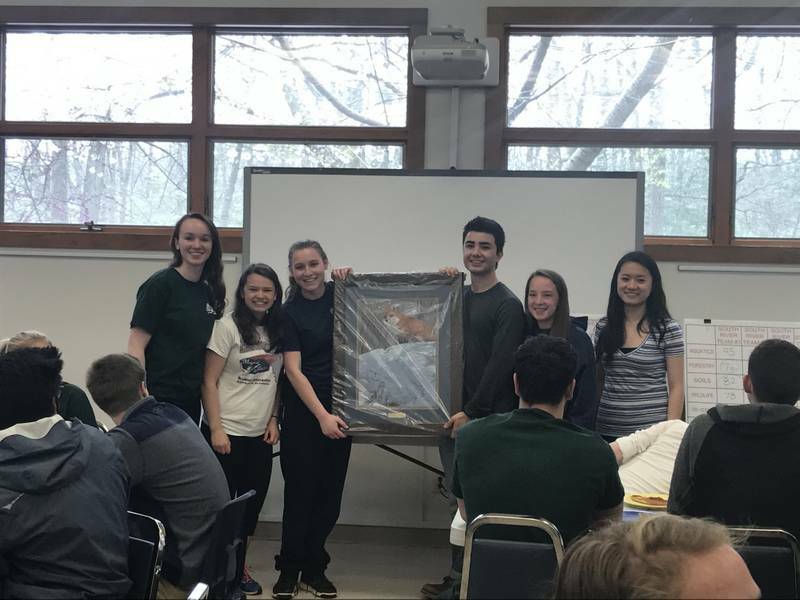 April 7, 2017 (Annapolis, Maryland) — Students from South River High School continued their streak as the first place winner in the Anne Arundel County Envirothon on Monday, April 3. Fifteen teams from eight county schools took part in the competition, which was held at Arlington Echo Outdoor Education Center in Millersville. South River High School has won the local competition for eleven years in a row. The Envirothon is a hands-on environmental training competition for high-school aged students in the United States and Canada. Students compete in teams to complete training and testing in five natural resource categories: soils/land use, aquatic ecology, forestry, wildlife, and a current environmental issue. This year’s fifth issue is agriculture soil and water conservation stewardship. “We were pleased with the fifth issue topic since that’s our area of expertise,” said John Czajkowski, District Manager of the Anne Arundel Soil Conservation. “The Envirothon is something that our entire staff and board look forward to each year. It’s a way of connecting what we do with the community.” In Anne Arundel County, the Envirothon competition is sponsored by the Anne Arundel Soil Conservation District. Other key partners include the Anne Arundel County Public Schools, tNatural Resources Conservation Service, and the Maryland Department of Natural Resources along with other state and County agencies. Anne Arundel Soil Conservation Board Member, Herb Sachs, presented the awards, telling students, “Don’t just consider environmental science as a major. In any of your studies, it is so important to look at what’s going on in the environment. It’s all connected.” In addition to being the overall winner of the competition, South River High School also took home trophies for top scores in Soils and Forestry. Severna Park High School earned two trophies for top scores in Aquatic Ecology and Wildlife. And Broadneck High School received a trophy for the fifth issue with a top score on the topic of Agriculture Soils and Water Conservation Stewardship. South River High School will represent Anne Arundel county at the Maryland Envirothon on June 15 and 16 at Camp Pecometh in Queen Anne’s County. Maryland is the host for the National Envirothon which will include 55 teams from the across the United States and Canada. The national event will take place on July 23 through 29 at Mount Saint Mary’s University in Emmitsburg. For more information about the Anne Arundel Soil Conservation, visit aascd.org and for more information on the Maryland Envirothon, visit mdenvirothon.org. ANNAPOLIS, Md., Dec. 5, 2016 – USDA’s Natural Resources Conservation Service is now accepting applications for enrollment in the Conservation Stewardship Program (CSP), the nation’s largest conservation program. Anne Arundel county farmers and landowners can obtain applications through the Anne Arundel Soil Conservation District office in Annapolis. CSP is for working lands that already have conservation practices in place. Agricultural producers and forest landowners can earn payments for actively managing, maintaining, and expanding conservation activities like cover crops, ecologically-based pest management, buffer strips, and pollinator and beneficial insect habitat – all while maintaining active agriculture production on their land. CSP also encourages the adoption of cutting-edge technologies and new management techniques such as precision agriculture applications, on-site carbon storage and planting for high carbon sequestration rate, and new soil amendments to improve water quality. New updates to the program will enable producers to better evaluate conservation options and the potential benefits to their operations and natural resources. Producers will be also be able to see potential payment scenarios for conservation early in the process. “This year, the Conservation Stewardship Program provides even more opportunities for conservation and greater flexibility at the local level to prioritize resource concerns and conservation approaches,” says Terron Hillsman, Ph.D., State Conservationist. “Customized CSP tools for Maryland will improve the customer experience during application evaluations.” This year’s sign-up runs through February 3, 2017. More information about CSP can be found online at http://www.nrcs.usda.gov/csp . Interested producers can also visit the Anne Arundel Soil Conservation District office located at 2662 Riva Road, Suite 150, Annapolis, MD 21401 or call the office at 410-571-6757.